ImageIQ For Aperture now with ImageIQ+ and ImageIQ Pro. ImageIQ+ is a refinement on the original algorithm and ImageIQ Pro is a completely new algorithm capable of finding images the others can not. If you’d like to provide feedback or suggestions send an email to support@ssoftltd.com. Available only as a direct purchase from us. 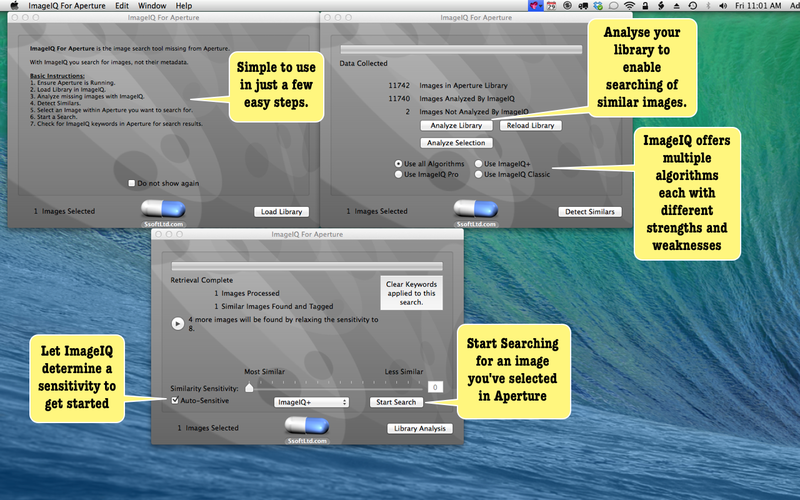 ImageIQ uses the same algorithms found in the latest versions of Aperture Duplicate Detector (ADD) and ADD For iPhoto. These algorithms visually profile your images and ImageIQ searches for similarities. It works to find these similarities independent of file format and image size. Most color adjustments are also detected. 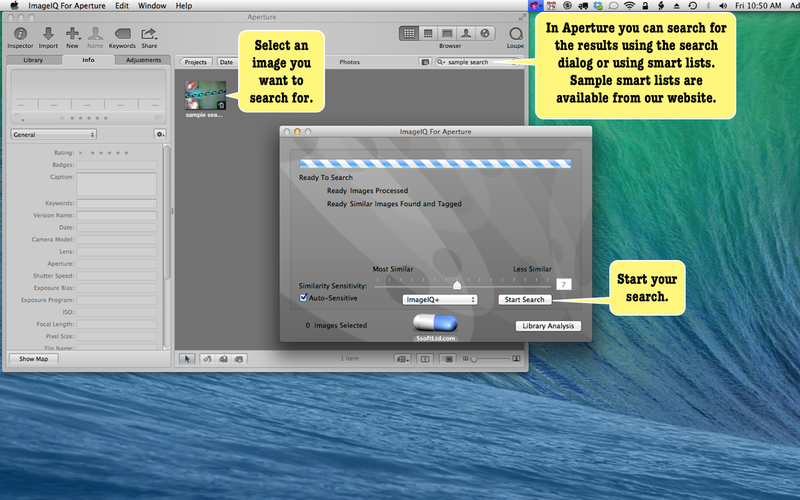 √ Use as a supplement to Aperture's Import to avoid accumulating duplicates. Basic Usage Instructions are available here. 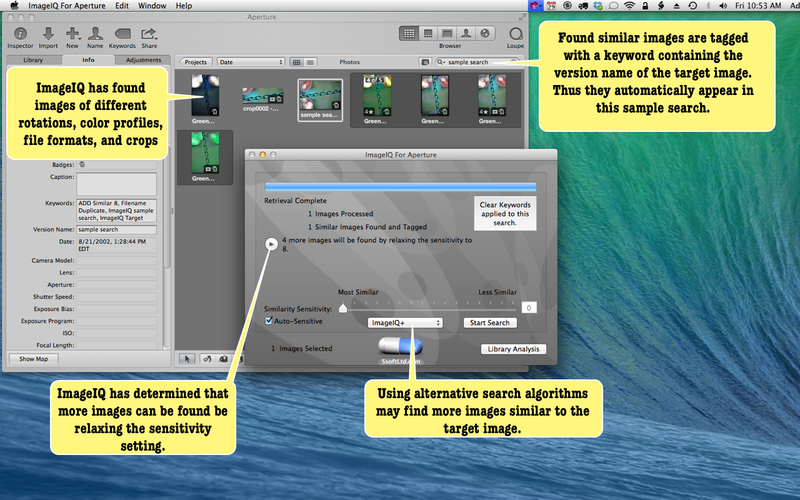 We can also automatically generate some smart albums that are very appropriate for processing your searches in Aperture. See this article for further details and instructions. The demo version will profile all images in your library. However, searching is limited to search through your first 10,000 library images. OS X Lion (10.7.x) and above. Visit the ImageIQ For Aperture Support Page. V1.4.5 Bug fixes particularly for Yosemite users. V1.4.3 Greatly enhanced performance when library path is supplied during analysis, especially in cases where iLife sharing data is disabled for a library. V1.4 Prevents machine from sleeping while analysing. Bug fixes and stability improvements. V1.3.5 Now allows searching to be performed while libraries are being analyzed. Minor bug fixes. V1.3.4 Introduces two new algorithms to be used in searching. ImageIQ+ (a refinement on the original algorithm) and ImageIQ Pro (a completely new alogorithm). Selection scan can now be used to update previous analysis. Bug fixes. V1.2.8 Searching is much faster. Critical fix for a bug that could cause a crash when starting an analysis. Counts of Analyzed images corrected. Auto-Sensitivity is now capped to 10 to prevent it from trying to hard to find an image. Tech support links in the help menu. Loading a library now shows progress. Much better peak memory footprints. Fix for found and tagged count when searching for multiple images at once. Other bug fixes.